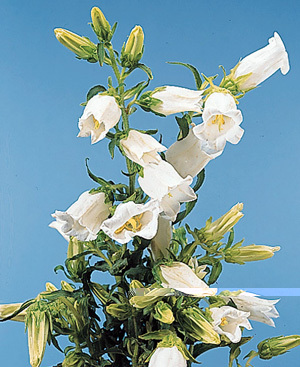 Home|Floral Library|Bellflower – Campanula spp. Decorative Life: Some state 5-7 days while others say 8-16 days. One report states that flowers should be harvested when flowers are about 50% open while another states when the first flower is fully opened. Engle et al. (1994) noted that seed-propagated plugs can be stored at about 27F up to 6 weeks with or without a light and low temperature treatment prior to storage. Member of the Campanulaceae (bellflower) family. Native to Eastern Europe and the Mediterranean region. Related species include Platycodon and Trachelium. Flowers bell-shaped to funnel-shaped, 1-2 inches wide and long, in loose clusters at the ends of long stems. Species are annual, biennial or perennial, classed as a dicotyledon, leaves not parallel veined. From the Latin “campana” (bell) referring to the shape of the flowers. Species useful as cut flowers: Campanula persicifolia, C. medium, C. glomerata, C. latifolia, C. pyramidalis. Many species are commonly used in gardens, especially in rock garden environments. First year roots and leaves of C. rapunculeus can be used in salads. Using ‘Champion Blue’ and ‘Champion Pink’, Bosma and Dole (2002) showed that vaselife in floral foam was 3.3 days whereas 10.0 days in a vase without foam, both with flower food solution.